Summary : A plesant tea from Stash. Nothing horribly fancy, but not too shabby either. Review : I love my local supermarket. It's the only place that I've ever been able to find bagged tea sold individually - not lumped together in some big box. I like that, because if you don't like the tea, you aren't stuck with 10 or 20 more tea bags that you know you won't like! And so, even though I always tend towards loose leaf tea, I happened across a single serving package of Earl Grey Black Tea from Stash at my local supermarket. Unable to resist, I pocketed the tea, paid my 7 cents (yes, 7 cents!) and headed out the door. Like all Stash teas that are bagged, the Earl Grey tea came well wrapped in a light-proof foil container. Upon opening the bag, the tea seemed fresh but definitely didn't overpower you with it's aroma either. Still, that wasn't a surprise - I don't think I've ever been overpowered by a bagged tea before - many of which I've actually come to like. To be truthful, I had no idea what to expect from this tea. 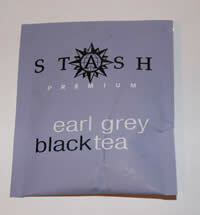 I've never had Earl Grey tea before, so tasting this version from Stash was a "new experience." Happily, it was also a good experience too. The tea had a relatively strong, but pleasing, taste to it. One reason for the pleasant taste, of course, is due to what Earl Grey tea is. Earl Grey tea is black tea that has been scented with bergamot, an oil that is extracted from a Mediterranean Citrus. While I've never tasted bergamot all by itself, the combination of black tea and bergamot makes for a fine combination. Another nice thing about this tea is that had a nice, rather soothing after-taste to it that tended to linger. Overall, anyone who likes black tea - or who is looking for a black tea to try - should give thought to picking up Stash's Earl Grey tea. It has a pleasant taste to it, doesn't taste strange like some teas do and has an excellent, lingering after-taste. Recommendation : Maybe not the world's most special tea, but it is a soothing tea with a plesant after-taste.